Car journeys with kids: Love them or hate them, they present a minefield of risks and stress for parents. Whether it’s the fight going on in the back seat, the spilled milkshake on the floor, the Frozen figurine that has fallen down between the booster, it’s easy to be distracted. Every parent has their own in-house policy for dealing with these distractions. Some simply scream threats, others try to distract with a DVD and others still use bribes to keep the kids from hanging out the window. Whatever your policy, there are some standard safety strategies that every family can adopt to keep their kids that little bit safer while going on a driving holiday, despite the mayhem. When I was a kid, seatbelts were optional, ashtrays lined the doors and the dog roamed free about the car. That’s certainly not true, at least in Australia, anymore. Regulations abound for child safety and fines apply to those who dismiss them out of hand. Kids between 4 and 7 years old are not permitted to site in the front unless there are no other seats available and children under 6 months must be seated in a rear facing position. harness restraints are by far the most popular and effective in the minds of many parents these days, even if the kids do sometimes object strongly to the discomfort they can bring on a long drive. While you want your kids to be safe, be careful not to over-tighten harnesses in your enthusiasm. Snug, firm, but with a little room to breath and move. 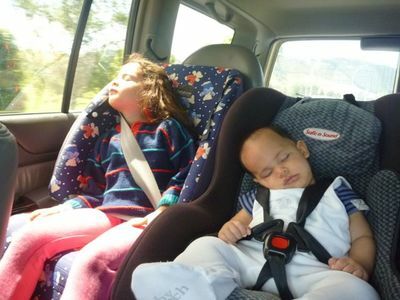 Kidsafe NSW have a complete guide on acceptable seating and child restraint requirements and each state in Australia will have similar protocols. Given that the highest number of deaths for kids between 0 and 14 years in NSW is road accident related, and are the second highest cause of hospital admissions, child restraint measures should not be treated lightly. And, though not always the most comfortable way to travel, they do save lives year by year. The Australian standard for windows and windshields is laminated glass which is manufactured by combining two glass panes of regular glass with with a PVB (polyvinyl butyral) interlayer. It is less likely to shatter when it’s struck and though the glass will crack under pressure it tends to stick together instead of flake into shards. 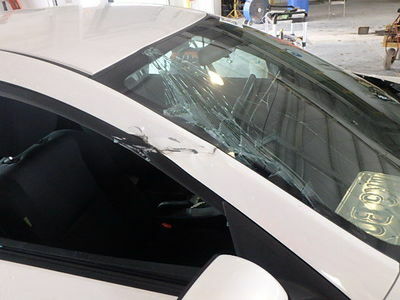 While all cars are fitted with this kind of glass, if you need to replace a windscreen or window, you are best to speak to a windshield installation specialist to make sure the glass you get meets the Australian standards. For standards, you can talk to the RMS and read their fact sheets. For installation advice, you can speak to an installation specialist such as Koala Glass. For those who drive about in classic cars prior to 1971, you may to purchase custom made glass windows and windscreens. Again, check with your local roads authority and also check with your insurance agent to ensure that the appropriate safety standards are being met. Another thing to consider is the tinting on your windows. Child safety is not only about avoiding injury during an accident. Long rides can actually put your kids in hot sun and stuffy conditions. We have all seen the lone red arm on people who spend a lot of time on the open road. The sun beats hot off the tar and the reflections from other traffic, not to mention the direct sunlight, can be injurious to kids on long journeys. You have a couple of options. 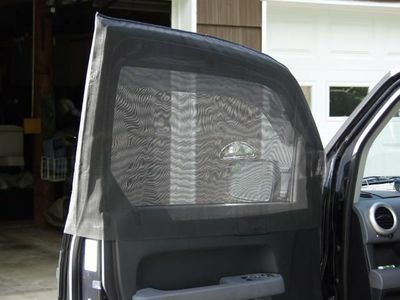 You can pay to have high quality window tinting that shields UV rays or you can install your own removable sun shades. The VLT (Visible light transmission) of the window tint that you install is important. In addition to the myriad of regulations, you also have to deal with the false information. Many people think that the darker the tint the better the protection. That’s not true. While it may help keep your kids a bit cooler in the car, dark tint does not stop ultraviolet light. Because of the cost involved, many parents opt for a simple self-install shade cover. These are great since they can be moved, adjusted and removed as needed. This is really important for infants who may not be able to get their head out of direct sunlight on long drives. Again, speak to a specialist. Find a window tint specialist who only deals with cars. You should also check your cars’ warranty and insurance stipulations as these bodies will also have guidelines for your make and model. If you want to have an enjoyable road trip with kids, it goes without saying (but I am going to say it anyway) that you should always factor in plenty of breaks. Fatigue is a big issue for drivers. The risk is compounded even further when you are also dealing with the stress, needs and fidgety nature of kids.